The old soldier bravely confessed his faith in Christ. After long exhortation, the governor gave orders to torture the Saint. They first beat him on the face, then cut off the skin from his face, and finally extracted his teeth. Hermias was then thrown into a burning furnace. When the oven was opened after three days, the Martyr emerged from it unharmed. The governor Sebastian ordered a certain magician to poison Hermias with a potion. The poisonous drink did the Saint no harm. A second goblet with even stronger poison also failed to kill the Saint. The magician, astonished that Hermias was still alive, believed in Christ the Savior, and was immediately beheaded. This magician, whose name we do not know, was baptized in his own blood, and received the crown of martyrdom. Hermias was then subjected to even more terrible tortures. They broke his tendons, clawed at his body with sharp instruments, threw him in boiling oil, and gouged out his eyes, but he gave thanks to the Lord Jesus Christ. 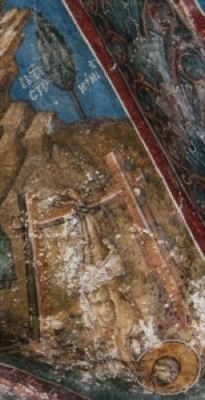 Then they suspended the Martyr head downward. For three days he hung in this position. People sent by the governor to verify his death found him alive. Struck by the miracle, they were blinded with fright and began to call out to the Saint to help them. 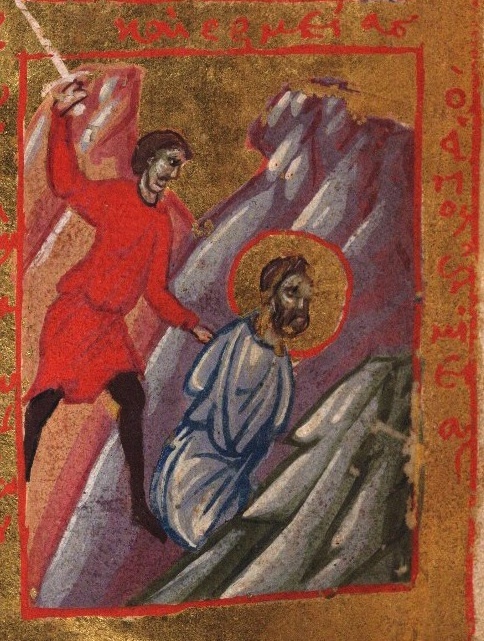 The holy Martyr ordered the blind to approach him, and healed them in the name of Jesus Christ. In anger the governor ordered the skin flayed from the Saint’s body, but he remained alive. Then the crazed Sebastian beheaded him with his own sword. 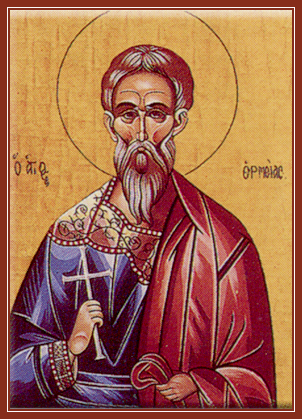 Christians later secretly buried the body of the martyr Hermias, whose relics bestowed numerous healings. From this poison, even the serpents would hide! Over the soldier of God, the poison has no power! Let be erased, the years of my shameful life! My entire life, in the service of these idols dumb. The One and the True God, the God of Hermias is. His only, are the miracles truthful. For the least servant, You, O Good One, receive me. For You, I will sacrifice, body and lifeless bones! The sword over him flashed and with blood, baptized him. Enlisted for Christ the King of all, thou didst hew down the enemy ranks, O glorious Hermias. After enduring many torments in thine old age, thou didst contest as God's warrior. Intercede with Him, O trophy-bearer, that all may be saved. Thou didst steadfastly confess the name of Christ, and endure grievous torments, O Hermias, and vanquish the ancient foe. With an aged body, in thy youthful ardour thou didst attain to the joys of Paradise.